Editor's note: Earl Wright, Project Santa Founder, was the Moore County Community Foundation 2017 Man of the Year. Article and photo republished with permission from The Pilot. Santa needs help, but not the kind provided by munchkin elves or GPS for his sleigh. 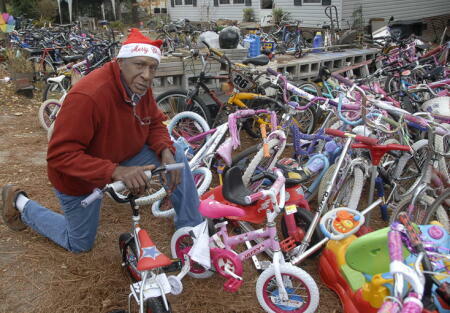 Earl Wright, Project Santa’s founder and main man for more than 20 years, needs used bicycles to repair and money to buy new ones. He needs trucks and drivers to pick up donations, transport them to his Aberdeen warehouse, then to IGA Fresh Foods parking lot in Southern Pines before dawn on Christmas. He needs cans of WD-40, inner tubes, rags and other supplies. Time is short. Although Wright commences work on next year’s giveaway a few weeks after Christmas, this season presented challenges. “So many disasters, floods and fires and hurricanes, people are trying to help everybody,” Wright says. “A lot of money went to Florida and Texas,” his second-in-command Sharon Thompson adds. But you can’t tell that to the children who sleep in cars or line up hours before the giveaway opens at 8 a.m. Some come from Fayetteville, Lumberton, Sanford and elsewhere. No questions asked, no registration required. In the past, Wright’s goal has been 1,500 bikes. In 2016 he collected 1,200. This year he’s aiming for 2,000. Last Christmas, 80 bikes were stolen from the lot after the event ended; many more were trashed. These bikes would have been hauled to Robbins, for a second giveaway. It broke Wright’s heart: “The kids up there are so grateful,” he says. “I never saw kids wait so patiently, be so polite.” One, he remembers, didn’t want a bike, only a hug from Santa. So far, Wright has collected approximately 800. “I’m not panicked, not yet,” he says. “We know it’s gonna happen. We trust God,” Thompson says. An arrangement with Walmart allows people to contribute in store to a fund earmarked for new bikes or bicycle parts. “I’ve got 500 bikes picked out, $49.99 each (unassembled) and waiting to be paid for,” Wright says. Thompson runs the selection process in an orderly fashion, with one change this year: a volunteer will help each child select a suitable bike without parental input since parents may lobby for a flashy new bike, not necessarily what the child prefers. Wright and Thompson’s efforts to share the holiday spirit do not end with bicycles. Every December they provide a needy family with a soup-to-nuts Christmas, including a turkey dinner, tree and gifts. Earl Wright’s devotion to children, expressed with a gruff kindness, has earned him recognition: In 2014 he received the North Carolina Governor’s Award for Volunteer Services. Then, in September, Wright was named Man of the Year by the Moore County Community Foundation. Anybody who has attended the bike event knows why. Bystanders watch, holding back tears, as little faces light up. If only they could see the hangar-sized warehouse, bikes leaning on each other like sardines in a can, awaiting Wright’s attention, a monumental undertaking, physical and otherwise, year after year. To volunteer bikes, trucks, manpower or money to Project Santa call Sharon Thompson at (910) 639-4048.